Today, in up to 400 communities across the country, thousands of parents, educators and allies will stand in solidarity with transgender and non-binary youth by hosting school and community readings of "I Am Jazz," a children’s book by transgender teen trailblazer and HRC Youth Ambassador Jazz Jennings. The unprecedented demonstration of support for trans and non-binary youth - from grassroots events in libraries, schools and community centers to readings on Capitol Hill - comes after a year of significant attacks on the rights of transgender people. The national day of readings was inspired by the more than 600 residents of tiny Mount Horeb, Wisc., who in 2015 unequivocally supported a young transgender student and her family and rebuked bigotry and censorship by showing up for a public reading of the book. The reading was organized by a caring local parent after legal threats by an outside anti-LGBTQ hate group forced the transgender student’s school to cancel plans to support her by reading the book in class. Over the last year, the transgender community has come under attack from anti-equality activists and politicians. In one of their first major acts, the Trump-Pence Administration’s Departments of Justice and Education rescinded lifesaving guidance promoting the protection of transgender students. This past summer, the President announced he would reinstate a ban on qualified transgender people serving openly in the military. Meanwhile, over the past three years, more than 500 anti-LGBTQ bills were introduced in roughly 38 states around the nation, many targeting transgender youth and, increasingly, anti-LGBTQ groups are also targeting schools and local districts seeking to welcome all students with inclusive policies and practices. The nationwide act of solidarity is sponsored by the HRC Foundation’s Welcoming Schools program and the NEA. It unites in action youth, educators, and allies who are hosting readings of "I Am Jazz" in hundreds of schools, churches, bookstores, homes, and community centers in states across the country. HRC Foundation’s Welcoming Schools is the nation’s premier professional development program providing training to elementary school educators to welcome diverse families, create LGBTQ and gender-inclusive schools, prevent bias-based bullying, and support transgender and gender expansive students. 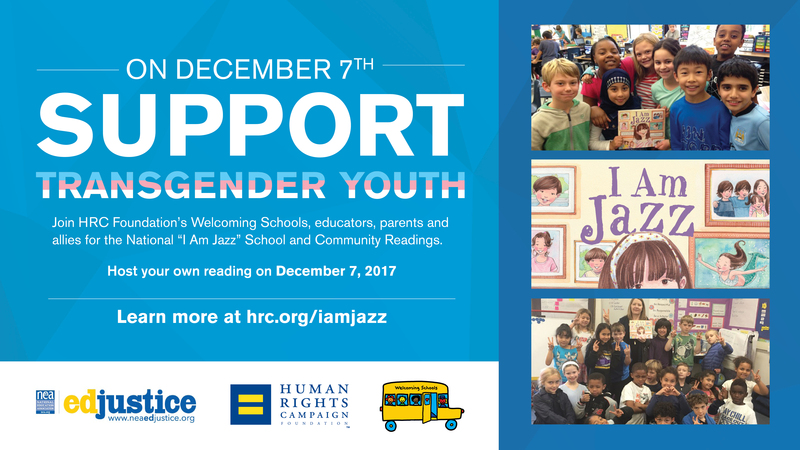 HRC’s Welcoming Schools has created this guide to help organizers of "I Am Jazz" reading events build more affirming and supportive spaces for transgender and non-binary youth. For more information visit, hrc.org/IAmJazz.